It's been two weeks since I returned from Namibia. 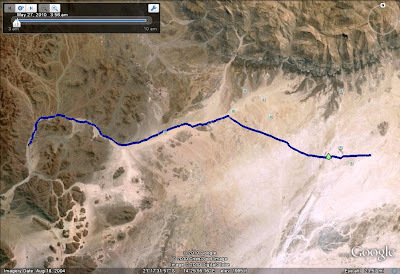 While in Country I participated in Across the Divide's Namibia Marathon in the Namib Desert. Running is new to me. I only started running after I signed up for the Namibia Marathon in the second half of 2009. The thought was to go on a destination marathon. After how much time I spent counting the minutes until my Tanzania trip in 2009 I thought having the "distraction" of training for a marathon would be good for me. I had no idea what to expect in my training; I figured that even if I had to crawl, I'd finish. Finishing was the goal, a return to Africa was the treat. 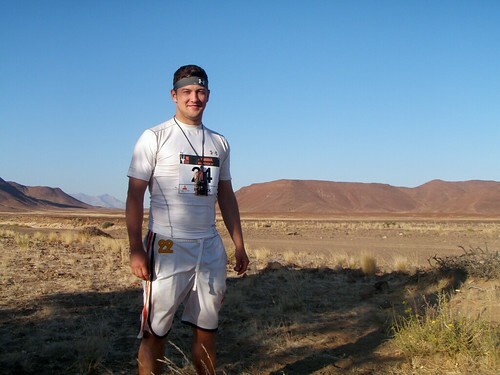 With a few Google searches along the lines of "Marathon in Africa" I came to the Across the Divide Namibia Marathon page. A Marathon in the desert...cool! It turns out ATD has Google to thank for more than a few participants of the Namibia Marathon and Ultra Marathon. The couch to 5k is a proven program. The couch to desert marathon is...untested. Training started well but as my runs got longer I began to struggle with injuries. In addition to an illness which took me off the track for two weeks, hip flexor issues, shin splints and IT band syndrome nearly stopped me in my tracks. By the time the trip was here I felt unprepared. I was comfortable with my level of commitment throughout my training but I felt another month would have helped a lot. I would have to make due with my fitness. The race was a fantastic experience and the participants were an indescribable bunch. I finished in six and a half hours, well within the 8 hour cut off. I learned a lot about hydration, electrolytes and my body after struggling with the worst cramping of my life. Having ones legs seize up every 20 meters for about 3 hours is a heck of an experience and one that made me feel even better about my accomplishment. Leading up to the race it seemed that the biggest challenge for the race would be the heat but that couldn't be further from reality- for me. With temperatures exceeding 100 degrees it's certainly an issue but for me the thought "it's hot" only crossed my mind a few times. Earlier on in the worst heat of the day I was fortunate to overpower those thoughts with ones of "there is no way you're not finishing this". The big surprise and the biggest challenge was the terrain. I was under the impression that the track would be relatively solid under foot. While a good portion of the race, especially early on is solid there are spots where you are running through several inches of sand...one might as well be running on a sand dune. In addition to the sand there was fine gravel which sucked the energy out of each step just as the sand. There were even a few small rock formations we had to climb over. My Garmin etrex Vista HCx GPS was great for the race and lasted through the sand, dirt, spilled water and accidental tosses. It did its job superbly and after 26.2 (well apparently 26.7)miles my treat is this display of the route. So I returned with a great sense of accomplishment and a renewed passion for the motherland. Africa is an amazing and expansive place. If Tanzania taught me the former, Namibia taught me the latter. The vastness is indescribable. And now I enter an exciting time: The search for the next adventure. The world is at my fingertips, and all I have to do is point and select. Great blog Ryan. You did a cracking job out there in Namibia, its hard to describe just how sapping the terrain underfoot was. Good job mate, looking forward to reading about your next adventure! Hi Ryan, I live in Ethiopia and am a hopelessly inactive person :) One activity I've always enjoyed is running and I'm in the process of trying to get myself to get off the chair and onto a road... will hopefully make it soon. I'm thinking of starting with the Couch to 5K program and then work my way up from there. 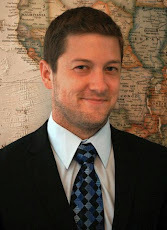 But being in Africa, I thought it would be great to set myself the goal of running a marathon in Africa someday. And that is what led me to your blog. Thanks for posting this. If you have any resources you would recommend for training for a marathon I would appreciate it. Thanks for visiting, David. Congrats on joining the world of running. Getting started is definitely the hardest part. If you get yourself out there a couple days a week it will get easier and easier and you'll be running farther and farther. For training, I suggest something like the Halhigdon.com. But again, just getting out there and starting is most of the battle! Good luck!